You may have seen ‘The placebo experiment: can my brain cure my body?‘ recently broadcast on the BBC. This was a fascinating programme in which doctor and broadcaster Dr Michael Mosley, who I met recently at his ‘Great Lives’ lecture at the University of Lincoln, conducted the largest ever trial to investigate the placebo effect in Britain. 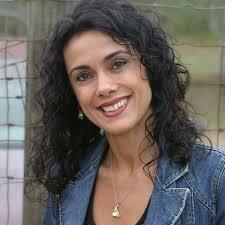 The effects of placebo on a group of back pain sufferers’ symptoms was extraordinary. Over the past 15 years in CaHRU we have been studying sleep problems and sleeping tablets and so I became interested in the placebo effect of sleeping tablets. A few years ago, in the summer of 2010, I was reading a book during my summer vacation which I bought from a high street bookstore, ‘The emperor’s new drugs: exploding the antidepressant myth’, written by Prof Irving Kirsch, emeritus professor of psychology at the Universities of Plymouth, Hull and Connecticut and associate director of the Programme in Placebo Studies (PIPS) at Harvard, US. I was interested to read it because, as a GP, I saw many patients with depression and I and my colleagues often prescribed antidepressants and were encouraged to do so by guidance of the time. The book was based on Irving’s ground-breaking research into the placebo effect which looked at the Food and Drugs Administration (or FDA, the US drugs regulator) data on antidepressants. Pharmaceutical companies are required to submit all their experimental data, comparing their drugs with placebo, to the FDA for approval in the United States. Irving and his PhD student Guy Sapirstein used the FDA data in a meta- analysis published in 1998 to show that for all but the most severely depressed patients the effect of the drugs was only marginally greater than the effect of placebo – the drugs worked but much of their effect was a placebo effect. A further meta-analysis published by Irving and colleagues a decade later in 2008 showed similar findings. 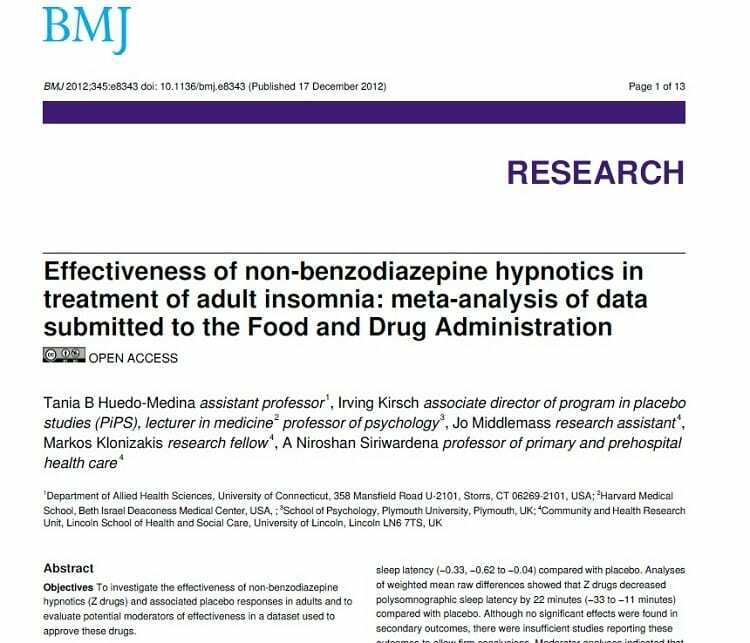 I thought we could do the same study with sleeping tablets to see how these drugs compared with placebo. I sent an email to Irving that afternoon while I was on vacation in Devon and to my surprise he emailed back an hour or two later saying he was wondering about the same thing. We agreed to meet and did so in Lincoln a few months later. The study was duly designed with a study team including Irving, a brilliant statistician Tania Huedo-Medina, and two of my research team at Lincoln, Drs Jo Middlemass and Markos Klonizakis. We obtained a small amount of internal funding from the university to pay for some of the project expenses, downloaded the data from the FDA website, filled four large folders with the information, and began the painstaking and laborious process of extracting the data onto a spreadsheet which Tania had constructed for the purpose. We met a few times at Lincoln to progress the project and had many enjoyable and interesting conversations. A lovely memory of our collaboration was playing the violin together one evening at our home in Lincoln. Several months later the data were analysed and were surprising. There was no evidence from the FDA data that people in these studies slept longer, woke less during the night or had better quality sleep. They did fall asleep slightly more quickly by 22 minutes measured using polysomnography in a sleep lab or 9 minutes subjectively using sleep diaries – and this was over and above similar levels of improvement with placebo, i.e. around half of the effect of sleeping tablets were due to placebo. Our study was published in the BMJ just before Christmas 2012. 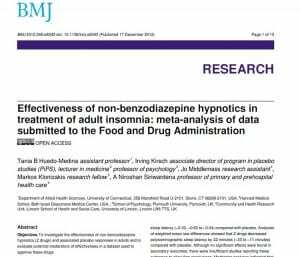 The paper, ‘Effectiveness of non-benzodiazepine hypnotics in treatment of adult insomnia: meta-analysis of data submitted to the Food and Drug Administration‘ has been cited over 160 times since then. I had an opportunity to discuss this with Dr Jeremy Howick, a philosopher and scientist who featured in the BBC programme, and who I met at the Society for Academic Primary Care annual scientific meeting a couple of years ago in Oxford. 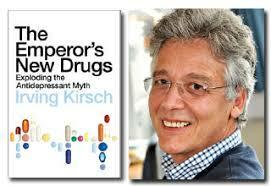 Irving is continuing his work on the placebo effect with Prof Ted Kaptchuk, director of PIPS. This entry was posted in Impact, News, Publications, Uncategorized and tagged CaHRU, FDA, hypnotics, impact, insomnia, meta-analysis, placebo, primary care, sleep, Z drugs by Niroshan Siriwardena. Bookmark the permalink.